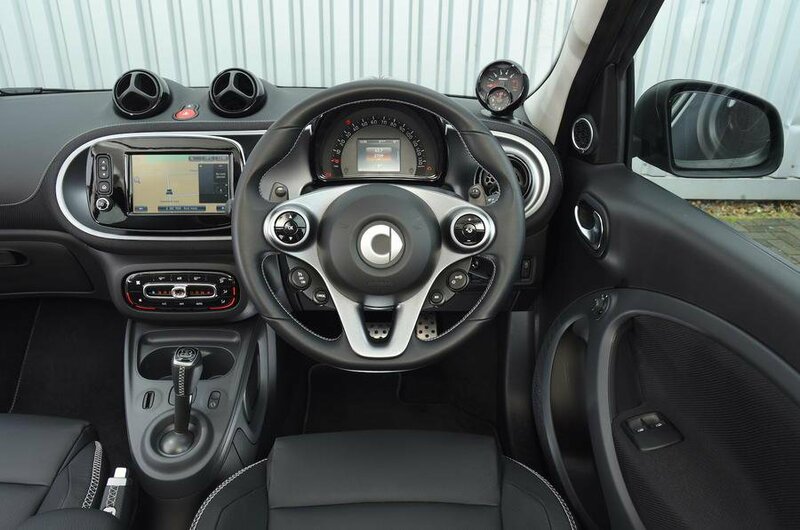 Smart Forfour Interior, Sat Nav, Dashboard | What Car? A height-adjustable steering wheel and driver’s seat are optional on all but Brabus Xclusive versions of the Fourfour, when many rivals offer these essential features as standard. However, if you do specify them, the car’s driving position is fine. Even with the upgrades fitted the steering wheel still doesn’t move in or out, but as you don’t need to stretch too far to reach it, this isn’t a big problem. There’s no rest for your left foot but because the seat, steering wheel and pedals are all nicely aligned, the Smart still manages to be comfortable, even on longer trips. The seat is supportive but as is the case with many city cars, the backrest is adjusted by a lever and ratchet instead of a wheel, so you only get a limited number of angles to choose from. All the buttons and controls are easy to reach and clearly labelled. Every version comes with steering wheel-mounted controls, so you can keep your hands on the wheel while making adjustments to the stereo. You have a clear view out of the Smart thanks to its large windscreen and thin pillars. The view out of the back of the car isn’t nearly as good, because the shallow rear window and thick rear pillars restrict your vision. We’d suggest opting for the Premium package, which adds rear parking sensors to help alleviate the problem. A rear parking camera is also available on the Premium Plus package, which also brings front foglights, and automatic lights and wipers. You have to pay extra for electrically adjustable and heated door mirrors. Without them it can be tricky to adjust the passenger-side mirror on the move, or keep the glass clear during the winter. Even entry-level Passion versions come with useful features such as steering wheel-mounted stereo controls and Bluetooth, plus USB, aux and 12V power sockets in the centre console. You’ll also find a multi-function 3.5in colour display in the middle of the speedometer that shows additional driver information. There’s a standard-fit dashboard-mounted cradle to hold a smartphone, and a free app you can download for Apple and Android devices. It allows you to operate the audio and phone functions, as well as stream music and run a sat-nav, all from your phone. If you prefer something more integrated, the optional Premium package brings an excellent, built-in 7.0in infotainment screen. It’s high definition and has smart graphics with easy-to-operate menus. As part of this package you also get sat-nav and MirrorLink, which displays a fully functioning replica of your smartphone’s screen on the car’s touchscreen. We prefer the usability of this system to the VW Up’s smartphone based system. A DAB radio is optional on all but Brabus Xclusive models, as is a JBL audio system. 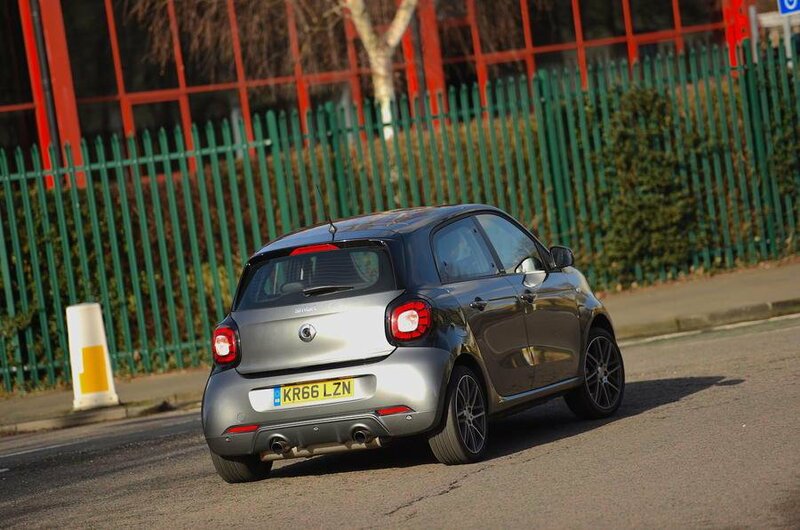 City cars can be quite spartan inside, with lots of harsh plastics on show. The Forfour’s interior still has some scratchy plastics dotted around it, although the dashboard has a pleasant-looking textured finish and smart, solid-feeling switchgear. Other nice touches include the slick action of the rotary air vents, as well as the leather-trimmed steering wheel and gearlever that are standard throughout the range. 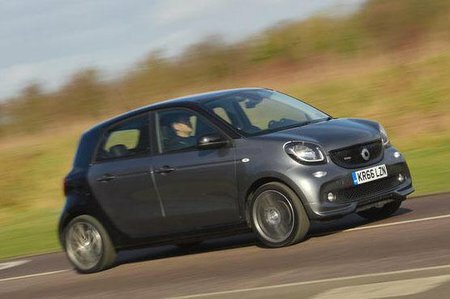 It certainly looks and feels better than the Renault Twingo’s cabin, and looks more exciting than the rather functional cabins of a VW Up or Hyundai i10.